On the same visit to Central Market where I bought the Himalayan Red Rice this past Thanksgiving, I also bought some more anasazi beans. 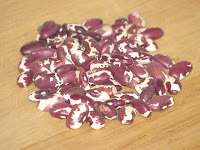 I thought they were also known as Jacob's Cattle beans, but a little research tells me that they are not the same, although there is some similarity in the color and markings. The anasazi beans might be smaller, although it is hard to tell from online photos. Rumor has it that the beans were discovered in a cave in the American southwest by an archaeological team from UCLA in a clay pot sealed with pine tar, which they carbon dated to about 500 BCE. According to the story, some of the beans sprouted, reintroducing this bean of the ancients to modern civilization. Although not likely, it does make a good story. I was not terribly pleased with my first attempt using this bean, which I wrote about here. But I have since been the happy recipient of the out-of-print Lean Bean Cuisine (there are still some available on Amazon.com - I cannot recommend this book highly enough if you are interested in introducing more legumes into your diet), which has made me very happy, especially because I found a recipe for Anasazi beans that looked like it had potential. I am not the biggest fan of bean chilis. In my experience, they never come even close to developing the kind of slow-cooked thickness that an honest-to-god chili con carne achieves, and so I have pretty much avoided both making and eating them. But this recipe really delivers that thick chili mouthfeel. 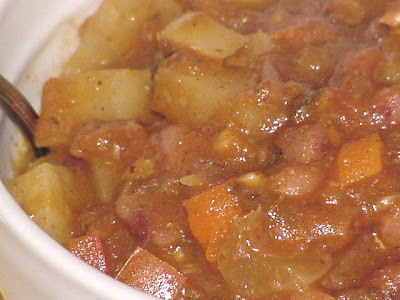 The unusual ingredients make for a surprising flavor, and there is the perfect balance between vegetables and beans. This one is definitely a keeper. And it goes really well with the Himalayan Red Rice. Place beans in plenty of water to cover in a saucepan and cook for 1 hour. Drain, reserving 1-1/2 cups of the cooking liquid, and set aside. Heat oil in large saucepan and add onion, bell pepper, eggplant, carrot, garlic, and chili. Saute for 7 minutes over medium heat. Add beans, reserved cooking liquid, potato, crushed tomatoes, sugar, and seasonings and cook for about 40 minutes over medium-low heat, stirring occasionally. Ladle into soup bowls and serve topped with shredded Colby or Havarti cheese and diced red onion. Thanks for this delicious recipe! I just wanted to let you know that I've linked to this post from my party planning blog. Check out our site for party planning tips, free online invitations and food & drink ideas. Beans are reintroducing of the chili to mountains and for the recommend for the recipient by the chef to absurd the exceeding. Analyzing of the beans too much need for the superstitions of essay services uk who are the eating chili for especially developed. Cooking of new dishes is in my blood I love to make a new dish. Now today I have no internet and I am making the bean of elite assignment help first time in my life and I am very excited to make this delicious dish.